We saw a lot of creative marketing trends in 2017. From growing popularity of podcasts to more brands jumping on Instagram, it was a good year for marketers. With that being said, what can we expect in 2018? While the year has started, we’ve already seen some emerging trends that show a lot of promise. You’ve probably read plenty of articles on upcoming trends for marketers, but how do you know which ones you should actually pay attention to? For a long time, social media was treated as a distribution channel. Marketers looked at Twitter, Facebook and Pinterest as platforms to curate content and funnel traffic back to their website. And while some brands still operate that way, things are changing. Marketers have realized that social media isn’t just a way to share your content. Each of these platforms can function as hubs for their own content. For instance, one of Canva’s core messages is diversity and inclusion. To support this, they create and share content across all its social channels to bring awareness of its stance on equality. But rather than strictly sharing the same piece of content on every channel, they create network-specific content as well. Then a Tweet with a custom graphic celebrating National Australia Day, with a focus on inclusion. Three different pieces of content across three different channels, all telling a similar story, but native to its respective platforms. This is a powerful and effective marketing trend that’s sure to carry on throughout 2018. Ten years ago, if I told you a brand known for manufacturing home appliances was starting a podcast, you’d probably be completely confused. Why would a company that makes refrigerators spend time and money doing a podcast? After all, companies that sell products and services are supposed advertise on podcasts, not host them, right? But today, when I tell you General Electric has a podcast, it doesn’t have that same shock factor. The idea of a company that sells shaving razors owning a digital publication also would’ve seemed a bit odd a decade ago. But today, Mel Magazine, created by Dollar Shave Club, has become a very popular publication that reaches an estimated 1 million-plus people every month. By this point, it’s pretty fair to say that content is arguably the most important piece of the marketing puzzle. The brands that have seen the most success in recent years are the ones that have put content at the forefront of their strategy. While we’ve already begun to see this shift taking place, in 2018 we’ll see more brands start to operate like full-blow media companies rather than strictly focusing on the products they sell. In addition to the examples we gave above with GE and Dollar Shave Club, there’s a long list of brands thinking more like media companies that strictly retailers. 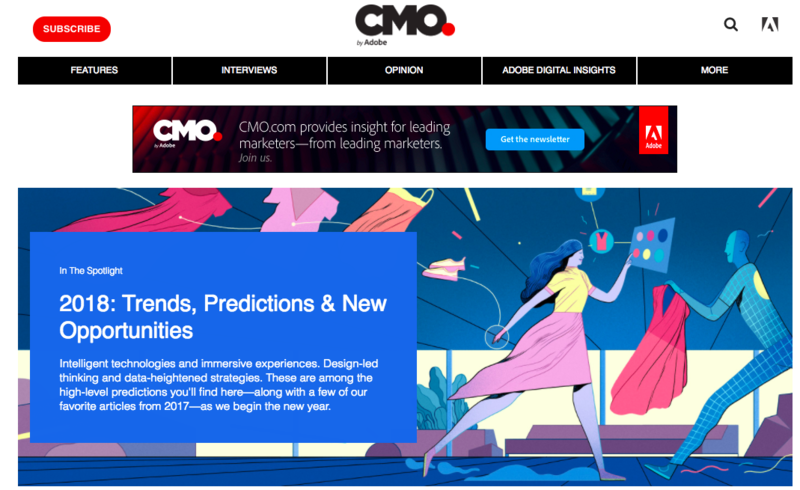 Adobe’s CMO.com site is one of the top media sites targeting high level marketing executives. And both AirBnB and Red Bull have actual print magazines. In fact, Red Bull is so invested in this marketing trend that it created its own media company. Brands are shifting away from heavy direct response ads that have the strict goal of selling, and moving toward using content to tell stories. Whether it’s through YouTube videos, blogging, digital publications or podcasts, brands are churning out more non-sales related content than ever before. With all the different algorithms out there, marketers constantly try to figure out how to “beat” the system. Whether it’s getting organic engagement on Facebook or improving your rankings in Google, there’s a continuous struggle to get your brand seen, but still appeal to your target audience. And what marketers realize is that if you focus on genuinely connecting with your audience, algorithms become less of a concern. For instance, Califia Farms doesn’t use 30 hashtags in every caption or spam other users to appeal to an algorithm. They use a handful of relevant hashtags and create content that appeals to their audience. The end result is an engaged community of followers for the brand. Remember, the point of all these different algorithms is to help users (a.k.a your audience) find the most relevant content. Google personalizes search results based on your search history and patterns. Facebook and Instagram push content to the top of your feed based on who you engage with most often. The more you meet the needs of your audience, the less likely you’ll worry about social algorithms. The concept of conscious capitalism isn’t new. And while brands like TOMS and Wholefoods are two of the more popular brands implementing it, plenty of others are on the same boat. For instance, Bombas Socks has built giving back into its business model as well. They also share their progress with their customers, so they can see how much of an impact their purchases have across the globe. In 2018, including a bigger message in your marketing is going to become less of a rarity and more of the norm. 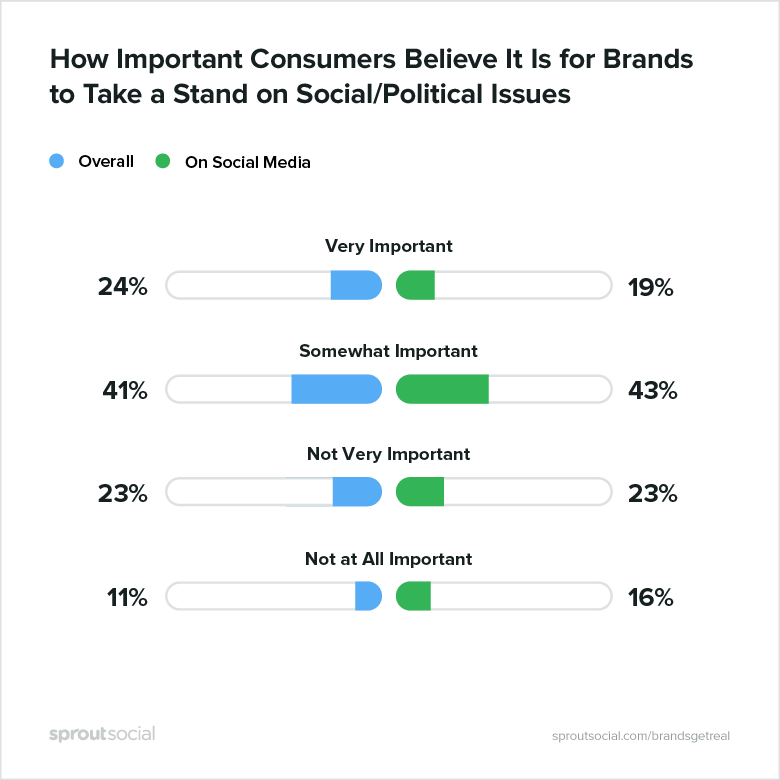 According to our #BrandsGetReal report, over 40% of consumers find it at least somewhat important for brands to take a stand on social and political issues. That doesn’t mean that every Tweet should be politically charged. But you need to be aware that consumers don’t just consider your products and services when they buy. They want to know what your brand stands for and what you’re doing for the world and your community outside of making money. Well in 2018, grabbing the attention of millennials is still important. But brands are also starting to shift some of their focus away from people born in the late 80’s and 90’s, and attempting to crack the code of Gen Z. As kids born in the late 90’s and 2000’s are starting to become adults and make purchasing decisions, brands want to understand how to reach them. The global Gen Z population is expected to reach 2.56 billion by 2020, and 84.7 million in the US. 85% of Gen Z uses social media to find out about new products. 32% of Gen Z watches at least an hour of video content online each day. Nearly half of those in Gen Z will spend 10 hours a day online. Brands are already catering to the needs of Gen Z, whether they know it or not. For instance, 63% of Gen Z prefers to see real people in ads rather than celebrities. That coincides perfectly to the growing trend of influencer marketing that we’ve seen. And just in case you’re still not convinced of the impact a younger demographic can have, take a look at this example. Athletic apparel brand Gym Shark was started by a teenager and grew into a multi-million dollar brand in just a couple years. And they’ve done it primarily through partnering up with non-celebrity fitness influencers to reach a younger demographic including Gen Z. If you look through Gym Shark’s Instagram feed, you won’t find a bunch of professional athletes or celebrities. You’ll see a reflection of their audience, millennials and Gen Z.
Pretend for a second that you weren’t a marketer. You’re just an average consumer that doesn’t know anything about Instagram ads, Facebook remarketing or any of that. When you’re browsing through Instagram or Facebook, how open would you be to buying something that you didn’t even know you needed, just because you saw an ad for it? Here’s a hypothetical example of what the typical buying process looks like. Let’s say you’re a brand that sells shoe insoles for runners. Depending on where potential buyer is in the buying process, you need to speak to them differently. Top of the funnel: Jane is just getting into running. She notices her heels are constantly in pain after running but she’s not sure why. She assumes it’s just because she’s new to running. Your marketing message: At this stage, you’d need to educate Jane on why runners get pain in their heels when they run. You’re not selling anything, just providing information through a video or blog post perhaps. Mid-funnel: John has been running for over a month, and he keeps getting shin splints. So he’s actively searching for things like “how to stop shin splints.” He’s looking for a solution to his problem. Your marketing message: Since John acknowledges his pain point, your job is to show him that there are viable solutions to fix his shin splints. An article, downloadable guide or video with tips on how to avoid shin splints could work. Bottom of the funnel: Mary is a runner that currently uses insoles, but want to test another product. She’s actively looking for a solution. Your marketing message: This is when you should directly talk about your product and direct people to your product page rather than educating them. A majority of the people browsing social media are more at the top of the funnel (Jane). Yet marketers advertise to them like they’re at the bottom (Mary). With all the increased interest in content marketing, marketers realize the top of the funnel is crucial. And now they’re starting to cater their content and marketing messages toward those consumers when running Facebook ads, blogging and producing other content. Here’s an example of how Intrepid Travel creates content for the top of the funnel. Instead of telling people to sign up for their small travel groups, they created a video of the top national parks in the U.S. So even if someone isn’t necessarily looking for travel plans at the moment, they can still get some value from the content. In 2018, marketers are starting to put a much bigger emphasis on optimizing for Jane and John, rather than assuming everyone is Mary. We’re not just putting this on the list because we make social media software. 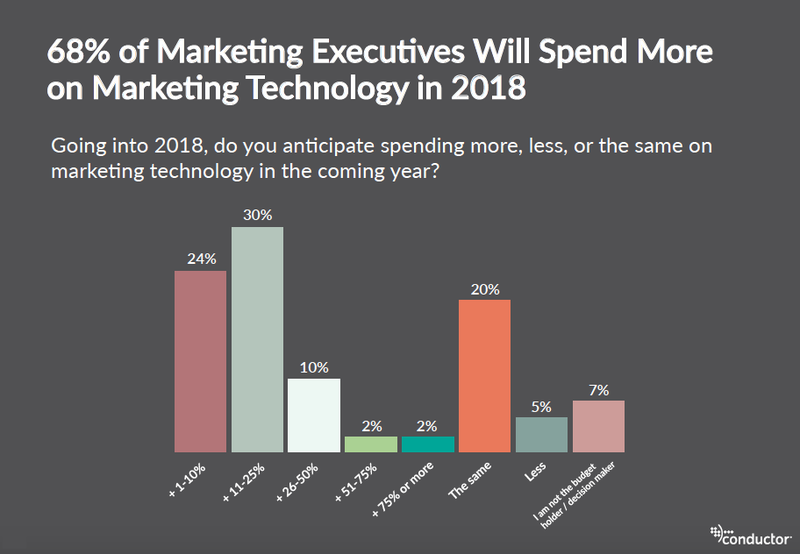 According to data from Conductor, nearly 70% of marketing executives expect to spend more money on marketing technology than they did in 2017. The increase makes a lot of sense when you think of all the advances being made in marketing software and technology these days. With the right marketing software, you can do in-depth analysis on what’s working for your brand, spot new opportunities, automate certain tasks and work more efficiently. For instance, if you were curious about how a specific Twitter campaign performed, having a Twitter dashboard to analyze everything is extremely helpful. Or if you’re looking for new content ideas, using a tool like Buzzsumo to see what’s popular on social makes the research process extremely simple. For pretty much every aspect of marketing, there’s some type of software to help you out. Make 2018 the year you invest in different marketing tools to make your life easier. If there’s one thing we saw a lot of in 2017, it was brands really showcasing their voices and personalities. Whether it’s all the sassy Tweets sent from Wendy’s, or the casual tone from Orbitz, brands have made it clear that they want to distinguish themselves. 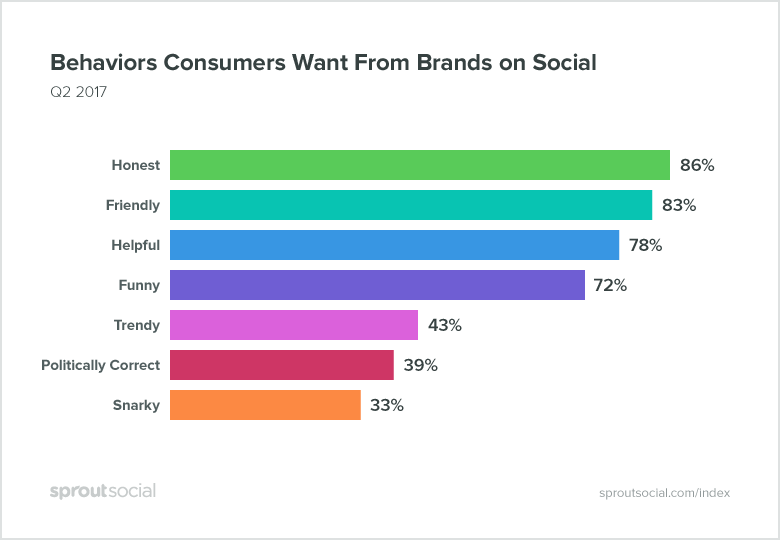 And our research shows that consumers like it when brands showcase personality. As long as it’s authentic and done with class. 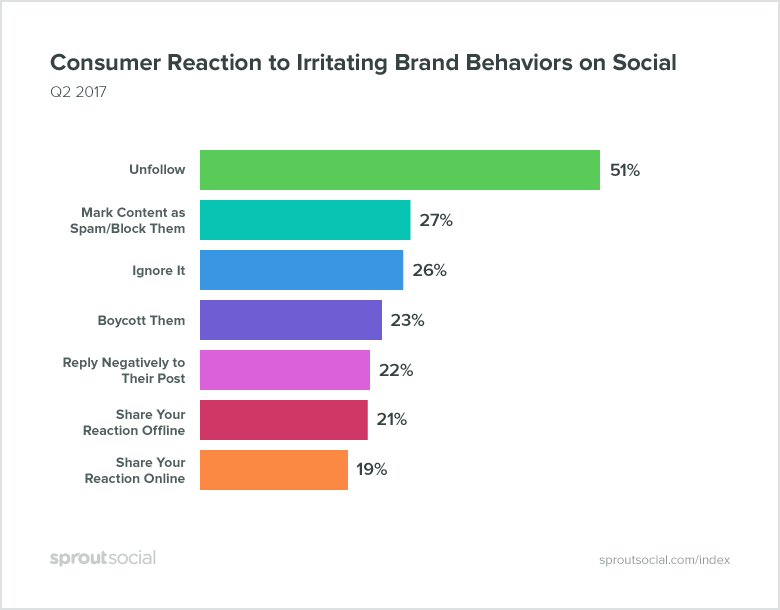 Our data also showed that over half of consumers will unfollow your brand if your personality on social media irritates them, and 23% will completely boycott you. A good place to start is by identifying your brand voice. It could be smart and witty, casual, the helpful aid or anything else that’s natural to your brand. Then start to create a social media style guide that outlines your voice and how you speak to customers on social and other platforms. That’ll build the foundation for your brand’s personality on social. A few years ago, being the transparent brand was the “cool” thing to do. It wasn’t something that was necessarily expected, but the brands that did it really stood out. Fast forward to today and transparency is less of an option. If your brand isn’t being upfront and honest about your practices, there’s a strong chance it’ll be exposed at some point. 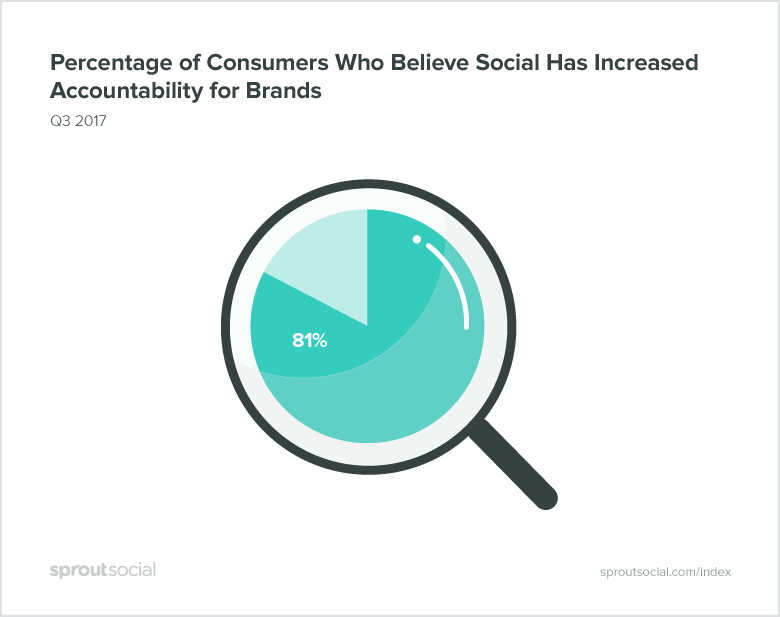 Our data showed that 81% of consumers believe social media has increased accountability for brands. 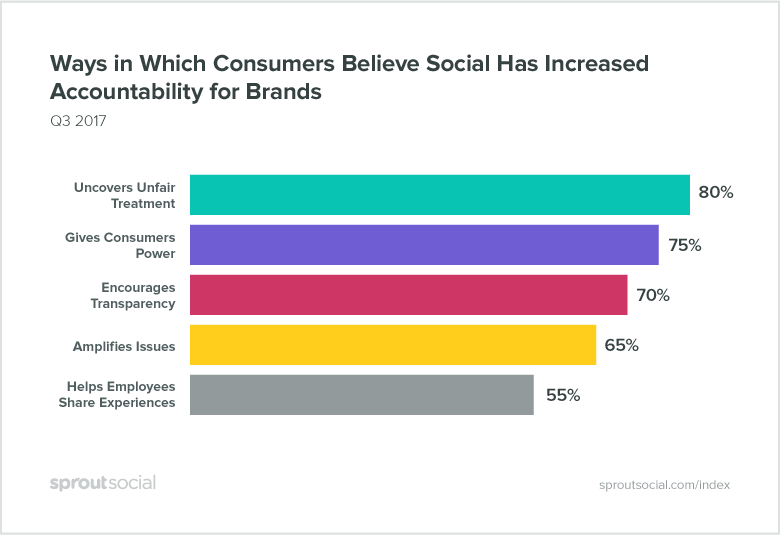 In addition, 70% feel that social media has forced brands to become more transparent. Long story short, in the age of social media, it’s best for brands to keep communication as open as possible. Share as much information with your audience as possible (when it makes sense) and don’t try to hide or cover up anything. It’ll likely come back to bite you. This marketing trend shouldn’t come as any surprise. Live video really took off in 2017 and that trend is just going to keep growing in 2018. Facebook and Instagram have a very strong position on live video, which is something marketers need to pay attention to. In fact, Facebook invested over $50 million to get content creators and media companies to create videos for Facebook Live. And with so many brands and content creators struggling to figure out how to get more engagement in the face of Facebook’s algorithm changes, live video is a great option. Even larger brands like Sephora see the value in Facebook Live. The video below received over 180,000 views. But it’s not just Facebook. Instagram Live is another channel that’s exploding in popularity. One of the biggest benefits of Instagram Live is that the recordings of your live streams appear at the top of your followers’ feeds along with stories. This is prime real estate to get your content seen without having to pay to promote posts for exposure. Plus, Instagram gives your followers notifications when you start a live stream, which is a great way to catch their attention. YouTube, Periscope, and plenty of newer live streaming apps give your brand unlimited potential to use live video to your advantage before it becomes saturated. This a really exciting marketing trend that you might not have thought about, but your competitors probably have. Branded communities have been bubbling up for a while now, and it’s starting to become much more commonplace. A branded community is just what it sounds like–a social community of your loyal brand advocates. For example, we have our Sprout Social All Stars community, which consists of some of our most dedicated customers. The community members are able to talk with each other through a private Slack channel, get exclusive resources and other benefits. Another example is Microsoft’s Xbox Ambassadors program. This is a community of devoted Xbox enthusiasts who go beyond just wearing swag. They help moderate the Xbox forums, host Twitch shows, create video content and more. Plenty of other brands including Lego, H&R Block and Random House all have their own branded communities. The great thing about building a branded community is that it can take any form. For instance, some create Facebook Groups, while others use Slack and some create separate websites specifically for their community. If you want to truly engage with your audience and build stronger relationships with your top enthusiasts, building a brand community should be a top priority in 2018. What Marketing Trends Do You Predict? You’ve seen our list of marketing trends to expect in 2018, but what do you see on the horizon? Are there any tactics or strategies you’ve seen brands implementing so far this year? Leave a comment or Tweet us to let us know!